I have had to take the day off work as I am sick and I am currently in bed, jammys on and snuggled into my dog. 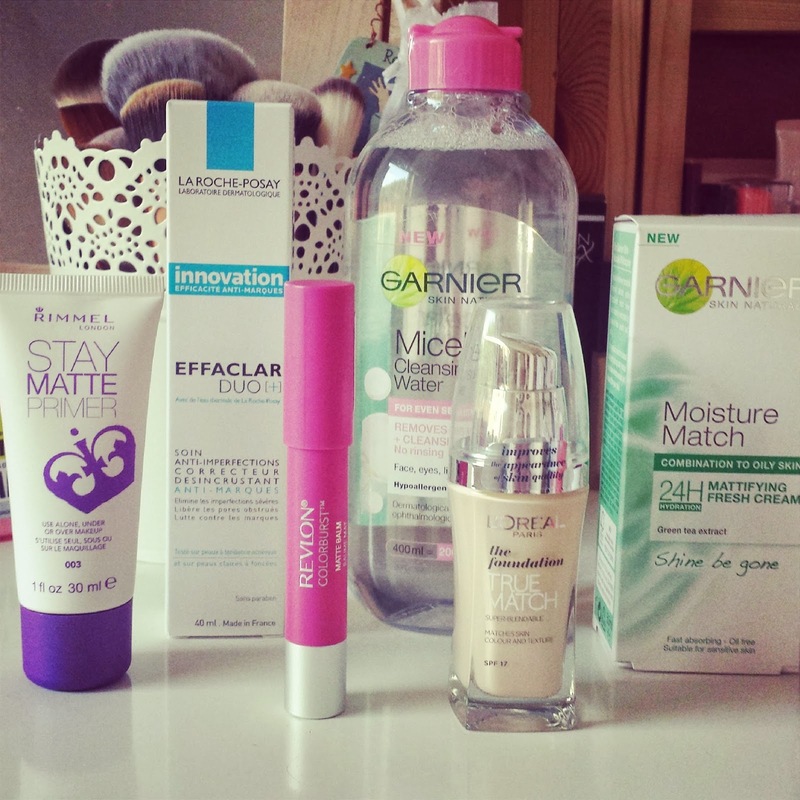 So I thought I'd bring you a beauty haul from my latest trip down the Aisles of Boots. This haul was purchased during 2 seperate trips on one day! I just couldn't get enough. This shopping trip was definetly influenced by beauty blogger hype and I went a little crazy on the 3 for 2 offer that is currently in store and online! (Check it out!!) They are having one of those Mega 3 for 2's when makeup and Skincare is on offer, and I love it. My first purchase was the La Roche-Posey Effaclar Duo+. I have heard everyone and their dog talk about the wonders of this product and as I have acne prone skin I thought I'd give this a go. It claims to, 'correct the appearance of imperfections, unclogs pores and fight against marks'. I am still trying to work out how best to use this as I've heard some people use it as a serum before moisturising and others using it as a primer before applying foundation. If any of you have any advice, please leave a comment on this post. Next up is the New Garnier Micellar Cleansing Water. I have previously used the L'Oreal Skin Perfection 3 in 1 Purifying Micellar Solution, but was not really impressed. It ran out really quickly and dried out my skin a little. The Garnier version is double the size and around the same price and I'm gonna keep using it and I will do a review soon to update you guys on what I think. I picked up the Garnier Moisture Match Mattifying Fresh Cream Shine Be Gone for my 3 for 2. I am forever looking for the perfect moisturiser for my skin and I still do not know if I have found it. I have tried this a couple of times and I think I may have to go for a more richer moisturiser. Anyways, there are 5 different moisturisers in the Garnier Moisture Match range that are aimed at different skin types and needs. The Shine Be Gone Moisturiser is aimed at those with oily combination skin and it contains green tea extract. It smells really fresh and the consistency is lovely and surprisingly creamy yet I need to keep using it before forming an opinion. My first makeup purchase is the L'Oreal True Match Foundation in N1 Ivory. I read on Liana-Beauty that this was a dupe for the Giorgio Armani Luminous Silk Foundation. Having never tried that foundation but hearing and reading countless reviews about how it is the foundation to beat all foundations, I had to give this highstreet alternative a try. I have not fallen in love with it yet but I have only used it twice. I'll keep you updated. I am on a mission to find the perfect primer to keep my makeup in place and to prevent that awful orange oxidisation thing foundations do. I picked up the Rimmel Stay Matte Primer with the hope that I had found the perfect skin perfecting primer. I have only used this twice and I am really enjoying it so far so fingers crossed. Any amazing primer suggestions are more than welcome. Finally, I picked up the Revlon Colour Burst Matte Balm in Showy. I love The Revlon Matte Balms and I can't wait to have them all. This is the most amazing flamingo pink shade with fantastic staying power. I love how matte and hard wearing these lipsticks are, while being extremely moisturising. I wore this to work yesterday and got so many compliments on the colour. I am so tempted to go back to Boots for more 3 for 2 fun! The Lush Lip Scrubs are one of my Holy Grail Products that I use multiple times a week and I could not live without these little pots of magic. I have three of the flavours: Mint Julip, Bubblegum and Popcorn and they smell and taste amazing. 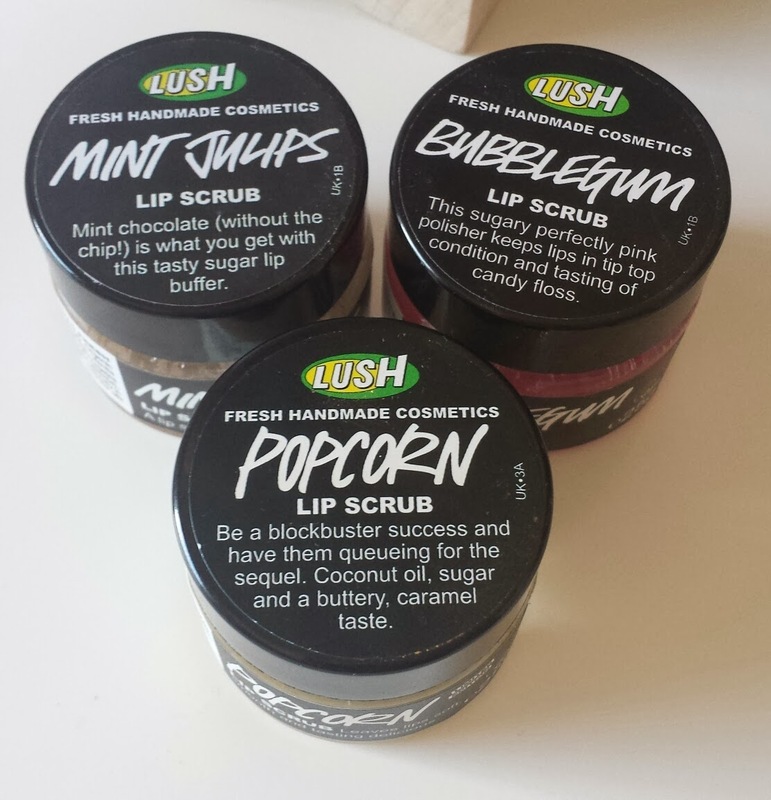 All three lip scrubs are made from Caster Sugar to exfoliate and Jojoba oil to soften the lips. Each contains different essential oils to add flavour and scent and they come in cute little jars. The Bubblegum Lip Scrub is bright pink and smells exactly like the Lush Snow Fairy Shower Gel, which I personally am a big fan off. A very sweet and delicious smell which leaves the lips soft and tasting amazing all day. My favourite of the bunch is the Mint Julips Lip Scrub. This smells exactly like After Eights and it always makes me crave minty chocolate. As well as leaving the lips soft and exfoliated, the peppermint oil within the scrub gives the lips a cooling and refreshing feel. Finally, I have the newest edition to my Lip Scrub Collection and that is the Popcorn Lip Scrub. This contains sea salt, coconut oil and popping candy flavouring to give the scrub the salty and sweet taste of popcorn. These have been a savour during the colder months, when my lips have been a little dry and flakey. After using the lip scrubs, I like to go in with a heavy duty lip balm to make sure they are super moisturised. I would reccomend the Body Shop Lip Butters because they are a favourite of mine. These are available in all Lush Stores and Online, and are only £5.50. This has been doing the rounds on the beauty blogosphere recently and there have been claims that it is better than the high end Oribe Dry Texturising Spray that was a much loved product to many in 2013. I have extremely fine hair which does not retain any curling or waving or backing combing that I put it through. My hair usually has one flat straight style which I am very tired of. 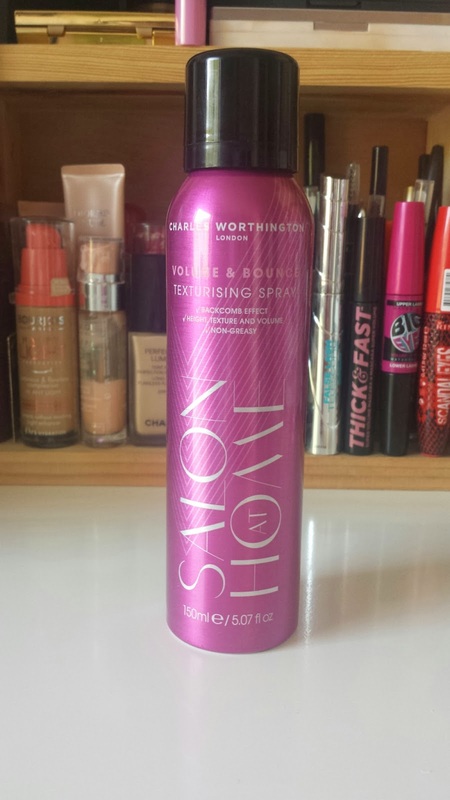 When I heard some of my favourite YouTubers raving about the Charles Worthington Volume and Bounce Texturising Spray, I had to get my hands on it. Since purchasing this amazing hair product, it has been an everyday staple in my hair routine. I haven't used anything like it before and was actually expecting more of a dry shampoo formula but was surprised to find it is more like hair spray, holding the volume in place while adding more volume at the roots. I spray this underneath layers of my hair to boost volume from beneath and then run my fingers through my hair to give a little tousle to add more hight, I love the results it gives my fine hair. I am one for washing my hair everyday but it is even greater on second day hair and it makes me not want to wash my hair everyday so I can rock the desired voluminous effect. I have recommended this to a few friends and let them try it out and they instantly fell in love. When I purchased it from Boots it was on a 2 for £8 offer so I would definetly go pick up a can. The Volume and Bounce Texturising Spray is part of their Salon at Home range and there are more products which I can not wait to try. This is one of those wonder products where you can't believe that you didn't own this sooner and you can't imagine life without it. 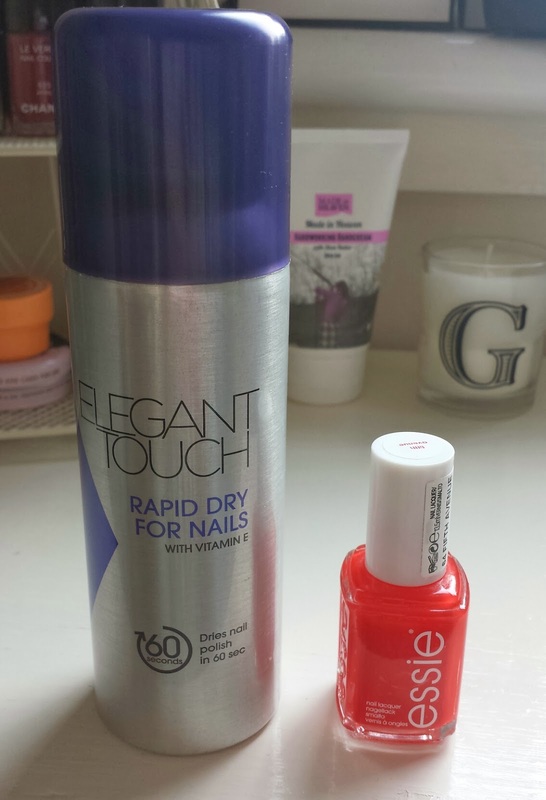 I received the Elegant Touch Rapid Dry for Nails in a Glossy Box a couple of months ago and just kinda forgot about it. Nope. You have smudged a nail and have to reaply another coat. I am one of those people that like to match their nails to their outfit, so I do tend to remove and reaply nail polish nearly everyday. The waiting game I play with the nail polish is not a fun game and so I rejoiced when I found this amazing miracle product. Rapid Dry for Nails claims to dry nail polish in 60 seconds and contains vitamin E to condition cuticles. You simpy paint your nails with the nail polish of your choice and then spray on the Rapid Dry for Nails. 60 seconds later, your nails are dry and glossy and there are no impending accidents waiting to happen. Can not reccomend this product enough and you can find it in most Boots stores for only £3.05. 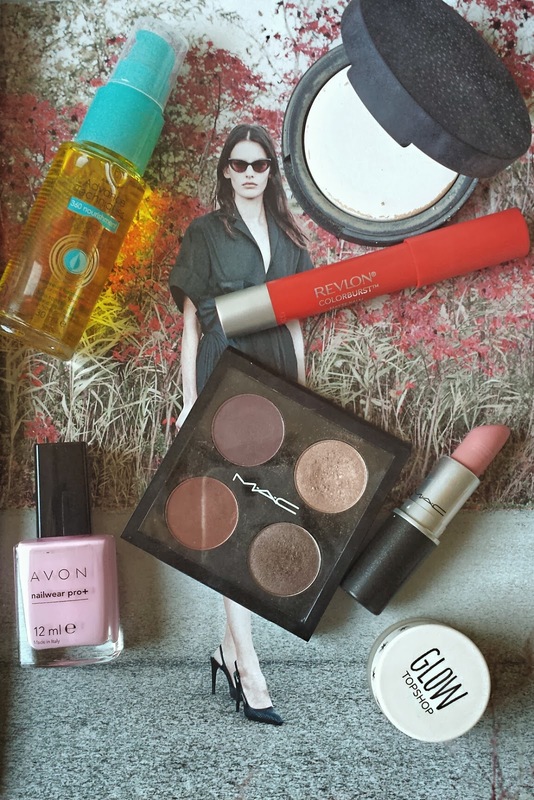 I don't usually do a non-beauty favourites but I have been loving some amazing things this month and had to share. Creme Eggs are back and it's barely just stopped being Christmas time, but I am not complaining. My favourite sweet treat should be around all year round for me to enjoy. I am guilty of buying like 3 Creme Eggs a day... And eating them on that day. I also found these amazing Creme Egg Biscuits that are the most delicious thing paired with a cup of tea. 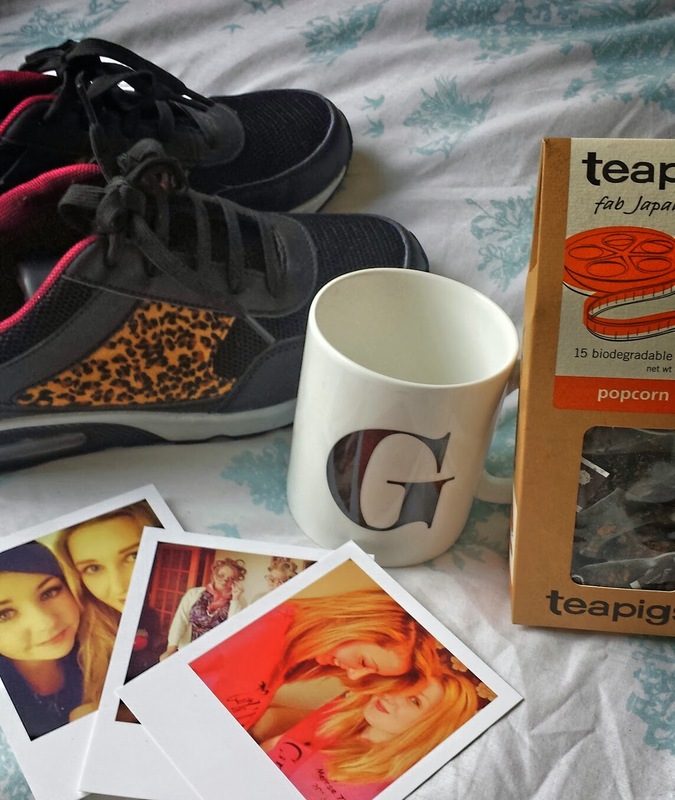 I have been obsessed with TeaPigs Tea for the whole of January, especially the Popcorn Tea. Apparently not to everyone's taste, it's a green tea with puffed rice and smells exactly like rice cakes. I love it! Another TeaPigs Tea that I've been loving is the Mint and Licquorice Tea (A personal favourite of my mums) it tastes like a warm sweet dessert and is perfect for the cold winter nights. I've been loving drinking my tea out of my Amazing G mug. I received this for my birthday from a friend and I love it lots and lots. Anything with a big G across the front is welcome in my home. If anyone knows me, they would know I am not one to join a gym or go for a run but recently, in the name of becoming healthy, I have been attending some classes with the intention of signing up to more. In honour of this new me, I picked up these Black and Leopard print trainers from New Look. I love the design and think they are super comfortable. One of my favourite purchases of the month. Another fashion favourite has been my rings. I love rings with a thin gold band, I think they look amazing with beautiful pastel nails. Urban Outfitters, New Look and Topshop are great for rings right now and I can't wait to add more to my collection. The two films I have been loving this month could not be more opposite. Firstly, I went to see The Wolf Of Wall Street at the cinemas and fell in love with Leo all over again. This film made me laugh till I could hardly breathe yet be shocked and disgusted at the same time. I will be picking this up when it's out on DVD for sure. secondly is Disney's new Frozen, oh my god, I love this movie. The characters, the plot and the soundtrack are fantastic and I have watched this like 10 times since Wednesday. My final favourite has been the Instagram Prints which I ordered from Firebox. They are amazing and are like little Polaroids I can stick up around my bedroom. I think that Instagram photos are my most up to date photos and love that you can get them printed of. They are amazing quality and you should definitely check out the website. I can not wait to discover new monthly favourites in February. First up is the Advanced Techniques 360 Nourishment Moroccan Argn Oil Leave in Treatment. I have been running two pumps of the oil through my damp hair on a daily basis and have been loving the results. My hair looks and feels fantastic after using this and it is fast becoming a Holy Grail hair product. I ran out of my beloved Soap and Glory One Heck of a Blot Powder and decided to switch it up and picked up the Topshop Setting Powder in White Lies. It is a great powder and sets my foundation nicely but the reason this is in my favourites is because it smells AMAZING. A launch I was very excited for was the Revlon Colour Burst Matte Balms. I purchased Striking as soon as they hit the shelves in Boots and have been wearing it every since. 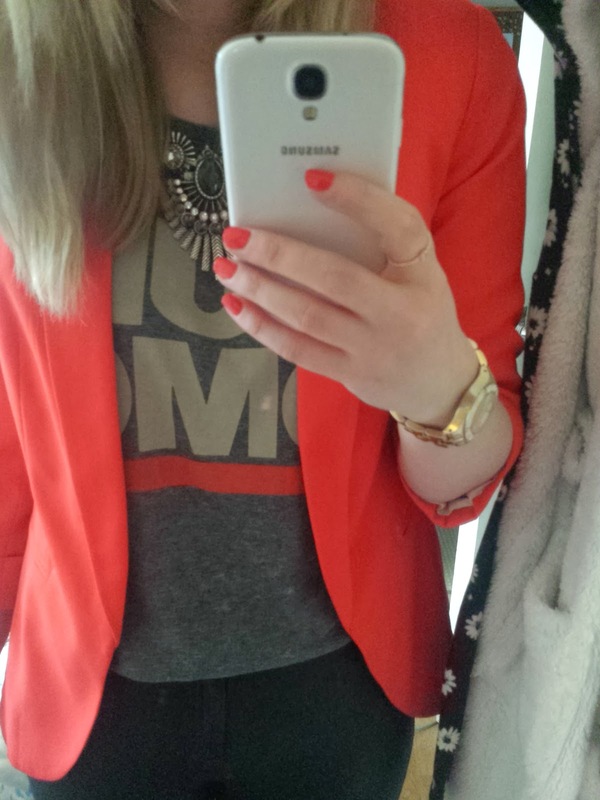 Striking is an amazing bright red shade that suits me perfectly. The formulation of these lip crayons are great, moisturising yet matte and super pigmented. I have since picked up more shades and introduced them to all my friends. I'm back into loving pastel nails to pair with the huge pastel S/S14 trend and my favourite for January has been Avon Nailwear Pro + Pink Creme. The perfect pastel pink shade. Check out my Pink Nails Post for other pastel pink favourites of mine. Another Mac Product which I have been loving this month has been Mac Creme Cup. This lipstick colour is the perfect everyday pink and has been living in my handbag for most of the month. Finally, I have been loving Topshops Glow Highlighter in Polish. I never used to be big on highlighters but since discovering contouring, the two have just gone together. I love the shimmer this gives to my cheekbones and I prefer the cream formula of this highlighter.